Volkswagen Golf BlueMotion - World's most fuel efficient car? Volkswagen Golf BlueMotion – World’s most fuel efficient car? It’s likely to stand in the shade of its more anticipated sibling the Golf GTi but the Volkswagen Golf BlueMotion is a very impressive addition to the stable. That’s because the Volkswagen Golf BlueMotion brings incredible fuel efficiency to family motoring – indeed it’s one of the world’s most fuel-efficient cars. This five-seater, with the usual traditional attributes associated with Golfs such as comfort, safety and practicality, has a combined fuel consumption of 88.3 mpg and CO2 emissions of just 85 g/km. Not only is that an incredible level of fuel efficiency (and owners should be able to do better with ‘energy-efficient’ driving styles) but it’s also a 15 per cent improvement over the previous-generation Golf BlueMotion. That model emitted 99 g/km (now the emissions of a standard Golf 1.6-litre TDI) and even the original Golf BlueMotion, unveiled at the Geneva Motor Show in 2007, returned an impressive 62.8 mpg with emissions of 119 g/km. With its 50-litre fuel tank and 88.3 mpg fuel consumption, the new Golf BlueMotion has a theoretical range of 970 miles. Assuming an average annual driving distance of around 9,300 miles most drivers will only have to refuel 10 times a year. Just think – not having to stare at the price of fuel as the digits whizz round in a haze. VW’s managed to improve fuel consumption in its BlueMotion by creating an innovative lightweight design which is 26 kg lighter in the running gear and 37 kg less in the body, plus a few modifications to the engine. There’s also super low rolling resistance tyres with higher air pressure, longer gear ratios (in the five-speed manual gearbox), the Stop/Start and battery regeneration systems that are standard in all new Golfs, plus specific aerodynamic modifications. Drag has been reduced by 10% (a major issue for saving fuel) and the BlueMotion has a lower ride – much lower than its fellow Golfs. At the heart of the new Golf BlueMotion is a 1.6-litre 110 PS TDI engine. The four-cylinder 16-valve unit develops its maximum torque of 250 Nm from just 1,500 rpm up to 2,750 rpm. Various measures such as reduced internal friction, an innovative thermal management system with shortened warm-up phase, exhaust gas recirculation, cylinder pressure sensor, two-stage oil pump, switchable electric water pump and water-cooled intercooler right in the intake manifold result in successfully reducing fuel consumption and emissions. To reduce emissions values further, Volkswagen has also implemented an oxidation catalytic converter, a diesel particulate filter and a NOx storage catalytic converter. 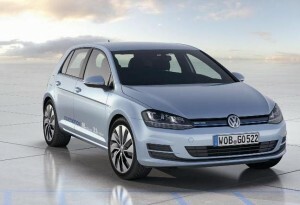 VW dealers start taking orders for the new Golf BlueMotion in May, with the first deliveries expected in August. Pricing and exact specification will be announced closer to launch (though expect to pay around £20,000). Seriously, compare the prices of the BlueMotion for its leasing costs since VW are among the dearer brands out there so someone must be offering savings/discounts. This entry was posted in Advice and Guides, Eco Car, Family Car, Popular Cars, Small Car and tagged car, fuel efficiency, fuel efficient car, GEM, Geneva Motor Show, Golf, Golf BlueMotion, Golf GTi, LS, LV, most fuel efficient car, MoT, price, seat, speed, Stop Start, TDI, Volkswagen, volkswagen golf bluemotion, VW by Steve Lumley. Bookmark the permalink.